Why should I hire a doula ? I have a whole page dedicated to the benefits of doula care here. 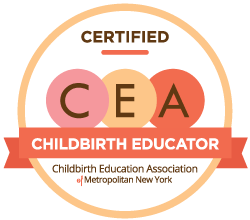 In New York State, a midwife is a medically-trained licensed professional who is focused on the clinical aspects of your care (in most cases you will either have a midwife or a doctor at your birth, not both). A doula, on the other hand, is not medically-trained - they are trained to provide physical, emotional, and informational support during labor and birth. While a midwife will be focused on the safety and health of you and your baby, as your doula, I will be focused on your physical comfort, natural pain management, your emotional state, and helping you to remember your preferences and make informed decisions. If I have a midwife do I still need a doula? As stated above, the roles of a midwife and a doula are different. While your midwife may be kind, caring and emotionally supportive, they will still have to maintain their primary focus on clinical care and the health and safety of you and the baby. Most midwives (even home birth midwives) will not remain with your continuously throughout your labor and birth. Your midwife will likely be checking in on you periodically throughout active labor and only remain with you continuously once you are in the pushing stage. As your doula, I will provide continuous physical, emotional, and informational support throughout your active labor and birth. What exactly is the role of a doula? Provide continuous emotional support and physical comfort (including massage, relaxation techniques, movement and positioning suggestions, cupping therapy, hydrotherapy - use of hot and cold water applications, herbal consults, aromatherapy, etc.) throughout your labor and birth. My goal is for you to feel confident, empowered, and in rhythm throughout your labor. Make suggestions for you regarding labor progress and help you use alternatives to medical interventions for pain management and problems with labor progress (such as massage and acupressure points, movement and positioning, laboring in a bath or shower, etc.). Assist you in making informed choices about your birth. I will help you access accurate information in order for you to develop your birth preferences. I can help you know what questions to ask your provider and give you additional information or explanation to help you understand your choices better. Answer questions that come up for your or your partner during labor or help remind you of anything that you may have forgotten from your childbirth education classes. Help your partner support you better and be there for you if they need a rest. I can provide reassurance and perspective to you and your partner and I can take some of the pressure off of your partner as the only support person. Bear witness to your experience as you move through a deeply important rite of passage and support you emotionally through this enormous life transition. Be accountable only to you. I am independent and self-employed (I am working for you, not your caregiver or hospital) so there will never be a conflict of interest in the way I support you. What is not within the scope of practice of a doula? Perform clinical tasks such as taking blood pressure, fetal heart checks, vaginal exams, etc. Make decisions for you. I will help you get the information you need to make an informed decision and remind you if there is a departure from your birth preferences. Speak to the staff on your behalf. I will discuss your concerns and help you with appropriate questions to ask as necessary, but you or your partner will communicate your wishes directly to the clinical staff. Take the place of your partner. In fact, I support your partner through the process as well and help them to support you better. Most partners have told me that having me there really helped them to be more present for the experience and focus better on what the birthing parent needs. When you are laboring more smoothly and you have someone there to continually reassure you and your partner, the atmosphere will be more relaxed and your partner will be able to be present to you in a calm and loving way (instead of continually worrying about what to do or if something is wrong). Can’t my partner/husband be my “labor coach”? Will the doula take away from my partner’s role? Your partner is an indispensable person to you in labor. However, they most likely have little, if any, experience with childbirth or natural pain management techniques for labor. According to studies, having the support of a partner and/or friend does not lead to reduced rates of epidurals, cesareans and other interventions the way that having a doula present does. Having the support of an experienced professional takes some of the pressure off of your partner as the only support person. If they need a rest at some point, you will not be left alone. Most partners have told me that having my support as a doula allowed them to be more present, calm, and focused for the birth, and helped them to support the birthing mother better. Here are some more practical reasons to have the support of a doula.